Joanna Oberg wins Midnight Run for second year in a row!! 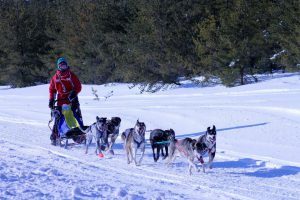 The UP200 is one of America’s premier 12-dog, mid-distance sled dog races and draws mushers from around the United States and Canada. 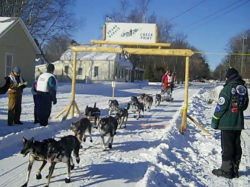 The first UP200 was run in February, 1990, after two years of planning by sled dog racing enthusiasts. The current race covers approximately 230 miles from Marquette to Grand Marais, with a return to Marquette along the same trail. The terrain includes stretches of near-wilderness, creek crossings, hills and valleys, and heavily forested land. Mushers say this is one of their favorite races, not only because of the challenging race, but because of the beautiful trail, the cheering crowds and warm welcome they receive at every checkpoint along the trail here in the Upper Peninsula. The UP200 is an Iditarod qualifying race. 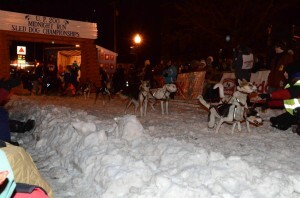 Registration is limited to 40 teams, and mushers are required to have finished the Midnight Run or other equivalent sixty (60) mile continuous running races within the past three seasons. Coinciding with the UP200 is the eight-dog Midnight Run (MNR). MNR mushers will leave the start chute in downtown Marquette on Friday night at 8:30 pm. The finish will be at Mattson Lower Harbor Park in Marquette on Saturday, February 16, 2019. The Midnight Run draws premier teams wanting to test their skill on a technically challenging trail. The teams will rest the required 5.5 hours in Chatham. Registration is also limited to 40 teams. The Jack Pine 30 (JP30) rounds out the weekend’s fun with a six-dog, 25-mile trail starting and finishing in Gwinn, Michigan. The JP30 will start at 10:00am on Saturday morning, February 16, 2019 from the parking lot of the First Baptist Church of Gwinn on North Billings Street. From there, it’s a race to the finish! The teams are expected back late morning or early afternoon in Gwinn at the First Baptist Church. This shorter race is an exciting run, start to finish in one day. Given the purse for the JP30, many mushers are finding the opportunity to finish in the money very exciting. The public is welcome at the Awards Ceremony, which will be held at the First Baptist Church after the last musher finishes. The rules for each race are posted here on the website under the Race Info tab, and mushers will also find registration forms and an online payment option through PayPal using either a credit card or PayPal account.